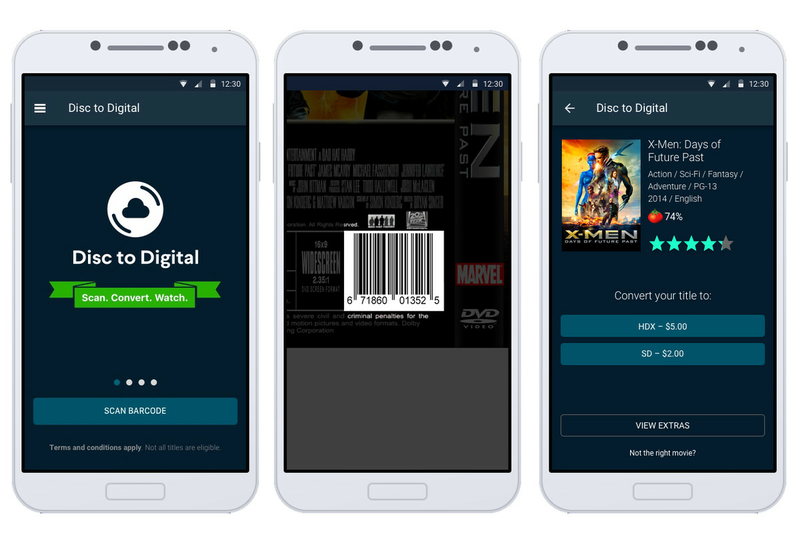 Walmart-owned Vudu is taking yet another step to simplify its disc-to-digital program. Starting today, all you need to “convert” DVDs and Blu-rays collecting dust on your shelf into streaming digital movies you can watch anywhere is the case they came in and your smartphone. To be a little more specific, you scan the film’s barcode using Vudu’s mobile app and your phone’s camera. (Both Android and iOS are supported.) From there, you pay a small fee to gain access to that same movie as an UltraViolet digital copy. 8,000 movies can currently be converted via the new method. “There is something for everyone including fan favorites like the Lord of the Rings, Harry Potter, and the Bourne series, as well as classics like Top Gun and The Godfather,” a spokesperson told The Verge in an email. Participating studios include Lionsgate, Paramount, Sony Pictures, Twentieth Century Fox, Universal, and Warner Bros. It costs just $2 to make a “like” conversion. The easiest way to think of that is by resolution / video quality. Converting a Blu-ray to an HDX (high bitrate 1080p) digital copy costs two bucks. Converting a DVD to an SD digital copy? Also two bucks. If you want to upgrade a DVD to a high-definition digital version, that costs a little more: $5 for each conversion. Current Vudu users will be gifted one free conversion for trying out the service. UltraViolet movies can be watched with apps including Vudu and Flixster (both of which support offline playback). Verizon FiOS also supports the digital locker via its set-top box and mobile app. But Amazon Video, a massively popular streaming service, still does not, so your movie library is no good there. Same goes for iTunes, obviously. Those are the ways most people get their digital movies, so it’d sure be great if they found a way to do something similar. And if not, so long as you’re fine using Vudu and find your movie collection wasting space, this is almost certainly a cheaper option than rebuying everything digitally. Disc-to-digital initially began as an in-store program at Walmart. But the company soon after started letting customers make the disc-to-digital conversion using a home PC. Now all it takes is a smartphone.